Donato Longano first appears in the Painesville, Ohio, area in 1903. In America, Donato Longano was known as Daniel Long. Donato Longano was born on March 16, 1883, at Elena (now part of Gaeta), Italy. He married Maria Carlone about 1902, at Italy. 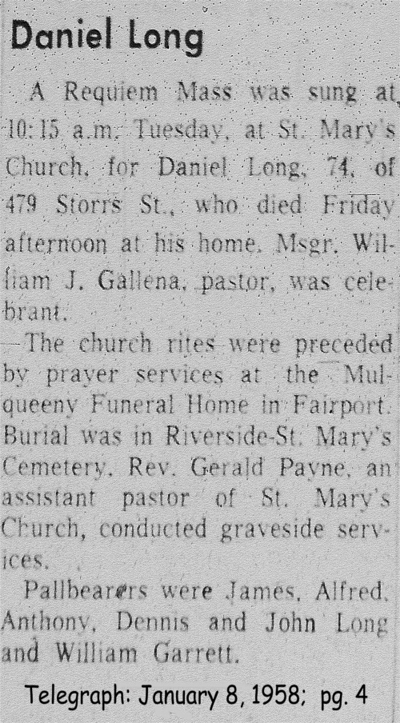 Donato died on January 3, 1958, at his home, 479 Storrs Street, Painesville, Lake County, Ohio, at age 74. His body was interred at Riverside Cemetery at Painesville, Lake County, Ohio. Donato Longano immigrated to the United States on April 7, 1903, at age 20. He immigrated at the Port of Boston, Massachusetts. His destination was New York City. Donato Longano became a citizen of the United States on March 6, 1939. Donato resided at 479 Storrs Street, Painesville, Lake County, Ohio, when he was naturalized. Mr. Long was employed by the City of Painesville gas department until his retirement. 1. Lena Longano was born on May 17, 1903, at Italy. She married Anthony Cutrone. Lena died on May 13, 1967, at Physician’s Hospital, Jackson Heights, New York, at age 63. Her body was interred at Flushing Cemetery at Flushing, New York. 2. Mary Long was born about 1906, at Ohio. 3. Charles Long was born on February 24, 1907, at Painesville, Lake County, Ohio. He married Catherine R. Prezioso, daughter of Felice Preziuso and Giovanna DiBiase. Charles died on April 25, 1983, at his home, Painesville, Lake County, Ohio, at age 76. His body was interred at St. Mary Cemetery at Painesville Township, Lake County, Ohio. 4. Ambrosine Long was born on August 21, 1908, at Painesville, Lake County, Ohio. She married Stanley Kline. Ambrosine died on November 11, 1941, at New York City, New York, at age 33. Her body was interred at St. Mary Cemetery at Painesville Township, Lake County, Ohio. 5. Evaline Long was born on August 21, 1908, at Painesville, Lake County, Ohio. Evaline died on November 25, 1918, at her home, Painesville, Lake County, Ohio, at age 10, from the Spanish Influenza. Her body was interred at St. Mary Cemetery at Painesville Township, Lake County, Ohio. 6. Joseph Long was born on March 16, 1910, at Painesville, Lake County, Ohio. Joseph died on January 1, 1979, at Lake County Memorial Hospital, Painesville, Lake County, Ohio, at age 68. His body was interred at Riverside Cemetery at Painesville, Lake County, Ohio. 7. Filomena Long was born on November 1, 1911. Filomena died on May 4, 1912. Her body was interred at St. Mary Cemetery at Painesville Township, Lake County, Ohio. 8. Phillip Long was born on April 18, 1913, at Painesville, Lake County, Ohio. Phillip died on March 3, 1990, at his home, Painesville, Lake County, Ohio, at age 76. His body was interred at Riverside Cemetery at Painesville, Lake County, Ohio. 9. Angela Long was born on April 12, 1915, at Ohio. 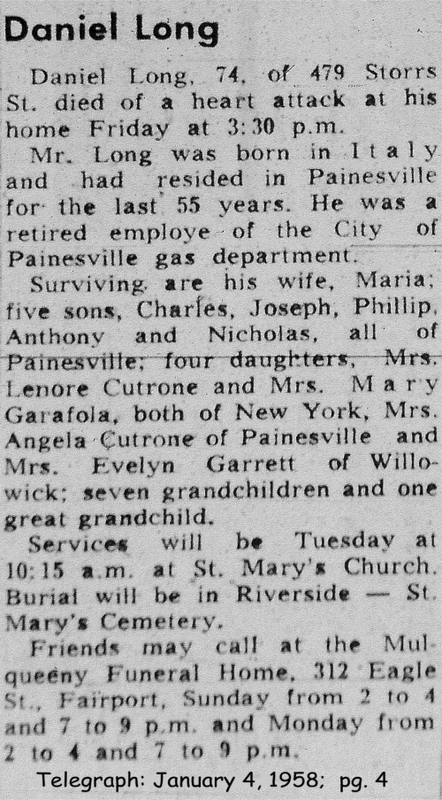 She married Charles C. Cutrone, son of Bernardo Cutrone and Helen Casterora, on July 5, 1945 at St. Mary Catholic Church, Painesville, Lake County, Ohio. Angela died on February 5, 1990, at Lakewood, Cuyahoga County, Ohio, at age 74. Her body was interred at Riverside Cemetery at Painesville, Lake County, Ohio. 10. Anthony Long was born on April 12, 1915, at Ohio. Anthony died on September 26, 1983, at his home, Painesville, Lake County, Ohio, at age 68. His body was interred at Riverside Cemetery at Painesville, Lake County, Ohio. 11. John Long was born about 1918, at Ohio. 12. Infant son . . . was born on April 4, 1919, at Storrs Street, Painesville, Lake County, Ohio. The child died the same day. His body was interred at St. Mary Cemetery at Painesville Township, Lake County, Ohio. 13. Evelyn Long was born on July 8, 1922, at Ohio. 14. Nick D. Long was born on February 27, 1924, at Painesville, Lake County, Ohio. Nick died on August 17, 1987, at City Hospital, East Liverpool, Ohio, at age 63. His body was interred at Riverside Cemetery at Painesville, Lake County, Ohio.